Price does not include decoration. Set-up charges, delivery, and taxes additional. 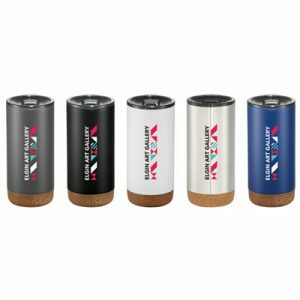 Skid-proof cork bottom, durable, double-wall stainless steel vacuum construction with copper insulation, which allows your cold beverage to stay cold for 24 hours and at least 8 hours for hot beverages. Fits most standard car cup holders. 18/8 stainless steel loose leaf tea infuser with mesh filter fits most mugs between 2.5-3.5 inches. 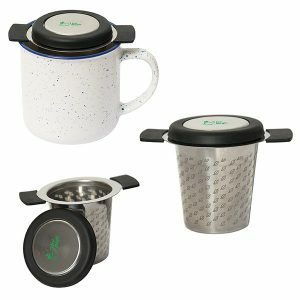 Removable lid keeps tea hot, and doubles as a saucer. 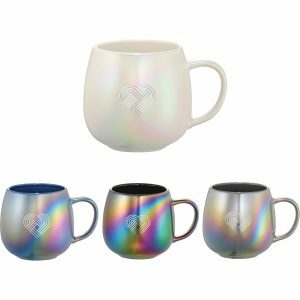 Mug not included. 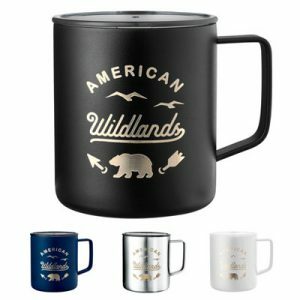 Warm up the campfire ambiance while drinking your tea or coffee with this classic camp cup. 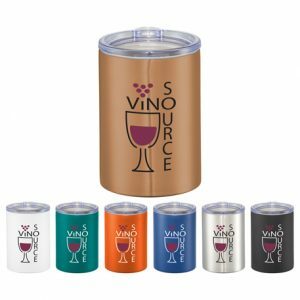 Durable, double-wall stainless steel vacuum construction with copper insulation, which allows your beverage to stay cold for 24 hours and hot for at least 6 hours. The antimicrobial preservative incorporated into the surface of this mouse pad suppresses the growth of bacteria, fungi and house dust mites to keep your desk area cleaner. The protected polyester material withstands daily wear and tear while displaying brand messages in vivid 4-color process imprint. Price includes full colour imprint. Set-up charges, taxes, and delivery additional. 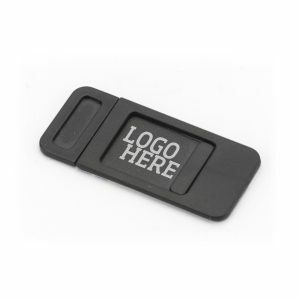 With this innovative, cork screw-on, lid design, your next promotion will be sure to stand out. Durable, double-wall stainless steel vacuum construction with copper insulation, which allows your beverage to stay cold for 48 hours and hot for at least 12 hours. 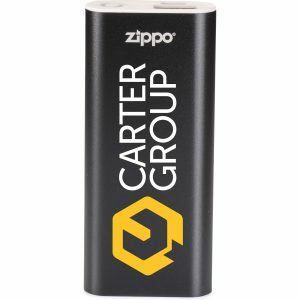 With this innovative, cork screw-on, lid design, your next promotion will be sure to stand out. Durable, double-wall stainless steel vacuum construction with copper insulation, which allows your beverage to stay cold for 48 hours and hot for at least 12 hours. The construction also prevents condensation on the outside of the bottle and the lid is spill resistant. Fits most standard car cup holders. 20oz. Minimum 35. Taxes, set-ups, delivery additional. 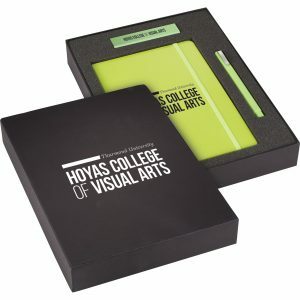 Includes: 2,200 mAh powerbank, 5.5" x 8.5" hard cover journal, and plastic pen, in a custom 2-piece black gift box. Add your logo to all items for 1 low setup fee (box optional). Minimum 36. Taxes, set-ups, delivery additional. Includes: 2,200 mAh powerbank, 5.5″ x 8.5″ hard cover journal, and plastic pen, in a 2-piece black gift box. Add your logo to all items for 1 low setup fee (box optional). Minimum 25. Taxes, set-ups, delivery additional. 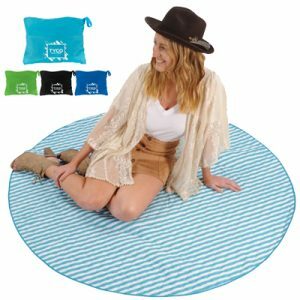 This 55″ round beach blanket folds nicely into a compact pouch for easy storage and transportation. The pouch turns into a hidden compartment that can be hidden in the sand under the blanket while in use. 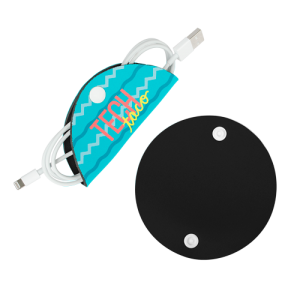 The hidden compartment is perfect for hiding things while enjoying the water! Storage bag includes carrying strap. From $71.38 - $89.93 each Minimum 6. Taxes, set-ups, delivery additional. From $33.70 - $42.45 each Minimum 12. Taxes, set-ups, delivery additional. Minimum 12. Taxes, set-ups, delivery additional. Enjoy exceptional sound of the Woven Fabric Bluetooth® Speaker. Be on trend with the knitted fabric cloth. 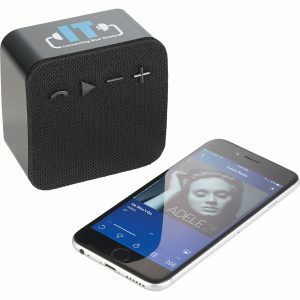 The speaker has a soft touch but packs a punch with a 5 watt speaker driver. 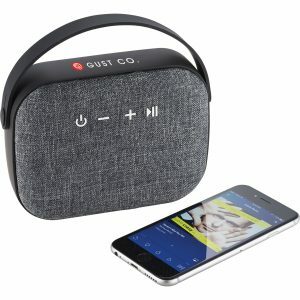 The built-in music control and microphone allows you to control the music and conference call from any location without touching your phone. 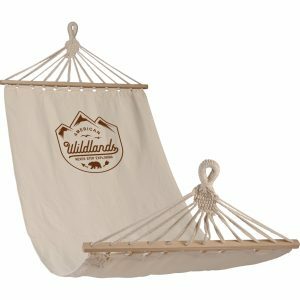 From $28.73 - $36.20 each Minimum 12. Taxes, set-ups, delivery additional. The Tech Taco is exactly what it sounds like; a taco for your technologies! It's an organizational tool that will help keep your cords and cables in order. Fold it around your bundled cords like a taco shell, snap, and you're on your merry way. 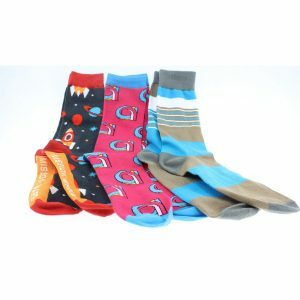 Includes a full bleed four-color process sublimation imprint on one side. Minimum 100. Includes standard imprint. Taxes, set-ups, delivery additional. The Tech Taco is exactly what it sounds like; a taco for your technologies! It’s an organizational tool that will help keep your cords and cables in order. Fold it around your bundled cords like a taco shell, snap, and you’re on your merry way. Includes a full bleed four-color process sublimation imprint on one side. Minimum 48. Includes standard imprint. Taxes, set-ups, delivery additional. 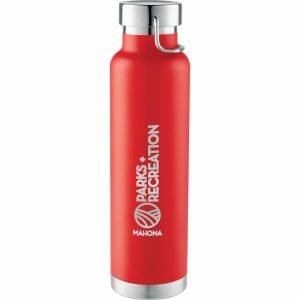 The 650ml Thor Insulated Bottle is a durable double-walled container made of stainless steel with copper insulation that allows cold beverages to stay cold for up to 48 hours and keeps beverages hot for at least 12 hours. Powder coated and perfect for engraving. Available in black, gray, navy, mint green, orange, process blue, red, silver, and white. From $18.68 - $23.53 each Minimum 24. Includes standard imprint. Taxes, set-ups, delivery additional. 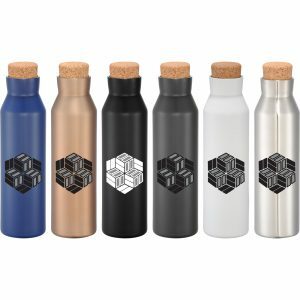 650ml Thor bottle is a durable double-wall container made of stainless steel with copper insulation which allows cold beverages to stay cold for up to 48 hours and keeps beverages hot for at least 12 hours. Powder coated and perfect for engraving. 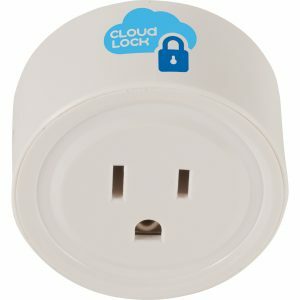 Secure your Privacy! Block your Webcam and stop Webcam Spying. The Sliding webcam cover fits computers, laptops, smart TV's, monitors, external webcams and tablets.1.5mm thick so laptops are able to shut with ease. Protects your webcam from scratches. 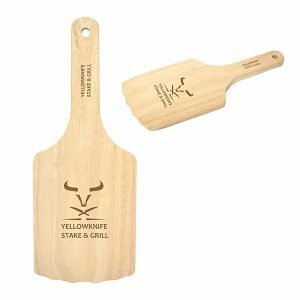 Made from high-grade durable plastic. Slide cover open and close easily without harming the camera lens. From $3.01-$6.30 Min. 100 units. Setup, taxes, and shipping extra. Secure your Privacy! Block your Webcam and stop Webcam Spying. The Sliding webcam cover fits computers, laptops, smart TV’s, monitors, external webcams and tablets.1.5mm thick so laptops are able to shut with ease. 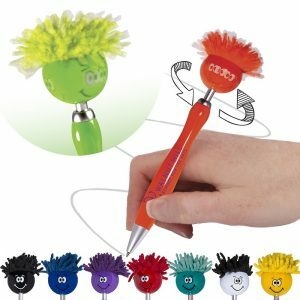 Simply attach with double sided adhesive that can be removed later. Protects your webcam from scratches. Made from high-grade durable plastic. Slide cover open and close easily without harming the camera lens. Includes paper backing card. Min. 100 units. Setup, taxes, and shipping extra. 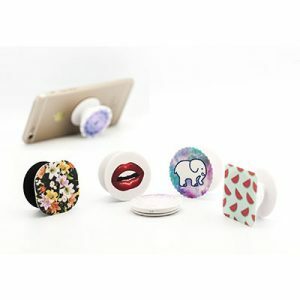 Conveniently sticks to the back of your smartphone or tablet and provides a handy grip so you don't drop it. It also acts as a stand and a cord manager when opened. The large logo area is done with a full colour digital print, giving you limitless creative options and great logo exposure. Available in White or Black in 3 fun shapes. Conveniently sticks to the back of your smartphone or tablet and provides a handy grip so you don’t drop it. It also acts as a stand and a cord manager when opened. 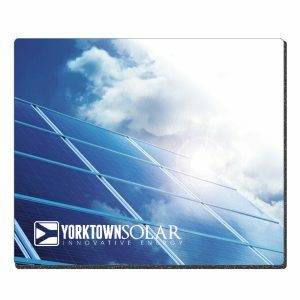 The large logo area is done with a full colour digital print, giving you limitless creative options and great logo exposure. Available in White or Black. 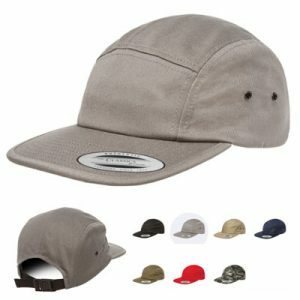 Classic camper 5-panel shape. Black clip closure. 4 black, metal eyelets. Soft buckram. Matching undervisor. From $13.11- $18.70 including 5000 stitches of embroidery. Minimum 12 pieces. Taxes, Set-ups and delivery additional. Price includes 1 colour print. Set-up, delivery, and taxes additional. Featuring breathable, waterproof construction and horizontal channel quilting, it has stylish details like a distinctive plaid lining, engraved metal snaps and small Roots73® patches on the lower left hip and back right hip. Available in Men and Ladies fits. Minimum 12 units. Setup, taxes, and delivery additional. 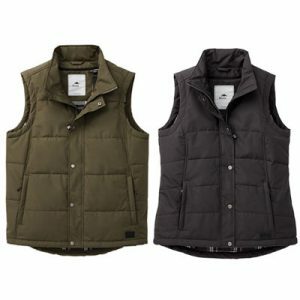 A classic look with a lot of versatility, the Roots73® Traillake Insulated Vest is ideal for the transitions from fall to winter and winter to spring. Featuring breathable, waterproof construction and horizontal channel quilting, it has stylish details like a distinctive plaid lining, engraved metal snaps and small Roots73® patches on the lower left hip and back right hip. Available in Men and Ladies fits. Price includes new BrandPatch decoration. Set-up, delivery, and taxes additional. •Padded laptop compartment protects and accommodates laptops up to 15.5”. The extra padding covers the sides and base of the laptop as well as the base of the bag ensuring a high level of protection. 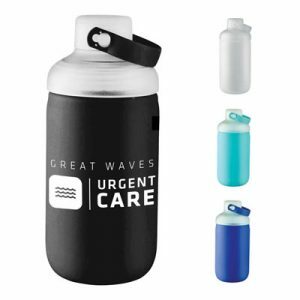 •Stay hydrated with your water in hands reach thanks to the two large external water bottle pockets. Their built-in heavy duty elastic accommodates various bottle sizes. •The flush front pocket is perfect for storing small personal items for easy-reach access. •The main compartment is conveniently accessible by opening the magnetic snaps without having to adjust the silicone straps. 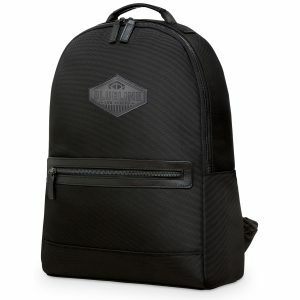 •The concealed exterior zippered safety-pocket is integrated on the back panel and securely stores your passport, credit cards or cell phone. The flush reverse zipper tape and soft zipper puller ensure a comfortable feel. •The detachable hook on the right shoulder strap enables you to unhook one strap and secure the bag to a table, chair or armrest. 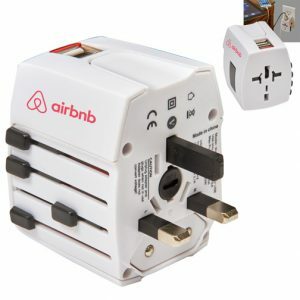 This will help prevent theft especially when travelling through airports, grabbing a bite at a restaurant or enjoying an afternoon at a coffee shop. 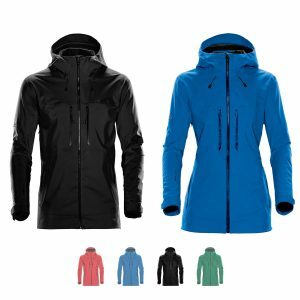 •The extra padded back panel and shoulder straps provide a comfortable wear. •Soft black mesh covers all parts that touch your body while wearing the bag to help increase air flow for better breathability. 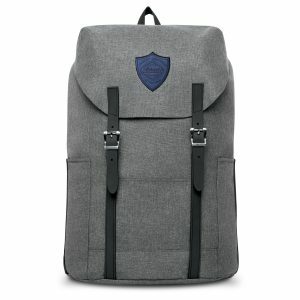 •The shoulder straps can easily be adjusted while wearing the backpacks by simply pulling on the strap tabs. Save the planet one drink at a time with this reusable silicone straw. Custom match the straw to your colour, and add your logo for a refreshing new way to promote your brand. The large top-access main compartment has ample room for many outfits, accessories and toiletries. Shoes can be placed in the side access storage keeping the main compartment clean and sanitary. •The large top-access main compartment has ample room for many outfits, accessories and toiletries. •Shoes can be placed in the side access storage keeping the main compartment clean and sanitary. •The two large inside clothing compartments are perfect for your undergarments and delicate fabrics. •The inside mesh pocket is for great for storing your media items and cables. •The side grab handle makes it easy to retrieve the duffle when stored overhead. •The cross body strap is removable if you prefer holding the bag from the top handles. •The strap stabilizer supports your shoulder when wearing the duffle as a cross body. The long strap has an adjustment slide for easy fitting. 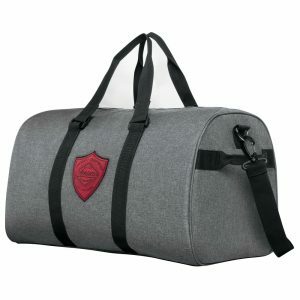 Padded laptop compartment protects and accommodates laptops up to 15”. The extra padding covers the sides and base of the laptop as well as the base of the bag ensuring a high level of protection. •Padded laptop compartment protects and accommodates laptops up to 15”. The extra padding covers the sides and base of the laptop as well as the base of the bag ensuring a high level of protection. •The organizer in the main compartment is perfect for storing stationary items. •The key clip is integrated in the top portion of the main compartment for easy access. •Store your essentials for quick retrieval in the flush front pocket. •The padded back panel and mesh shoulder strap underside ensure a more comfortable wear and increases air circulation for improved breathability. •The integrated top handle is perfect as a quick-grab point. 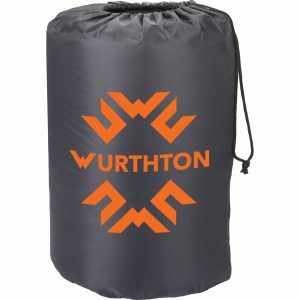 •The bag can hold up to 25 lbs of weight. The perfect partner for those evening runs in low light, with a fashion-forward heathered design. 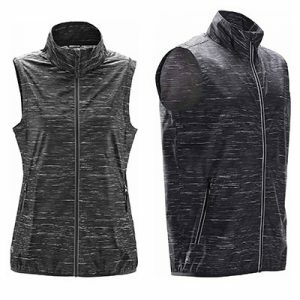 This Showerproof D/W/R lightweight shell vest features an elasticized hem to lock in warmth and reflective tape detail for added visibility. Available in Men and Ladies fits.